Grief and trauma are rarely the dramatic, sliding-down-a-wall-in-tears experiences you see in movies. Sure, sometimes there are big, emotional outbursts. But often it’s a dull but persistent numbness. Or it’s intense and boring at the same — like a very long labor, when you find yourself thinking, I cannot believe how been in this howling agony for this long. Author and artist Jonathan Santlofer learned it firsthand when his wife Joy passed away suddenly a few years ago. In his intimate, insightful and often funny new memoir, “The Widower’s Handbook,” he describes the otherworldly experience of watching the person you love die in your arms and the abrupt transition from one life to another. He also astutely observes the fluid experience of grief, something that does not unfold in an orderly fashion or take place in a strict time limit. 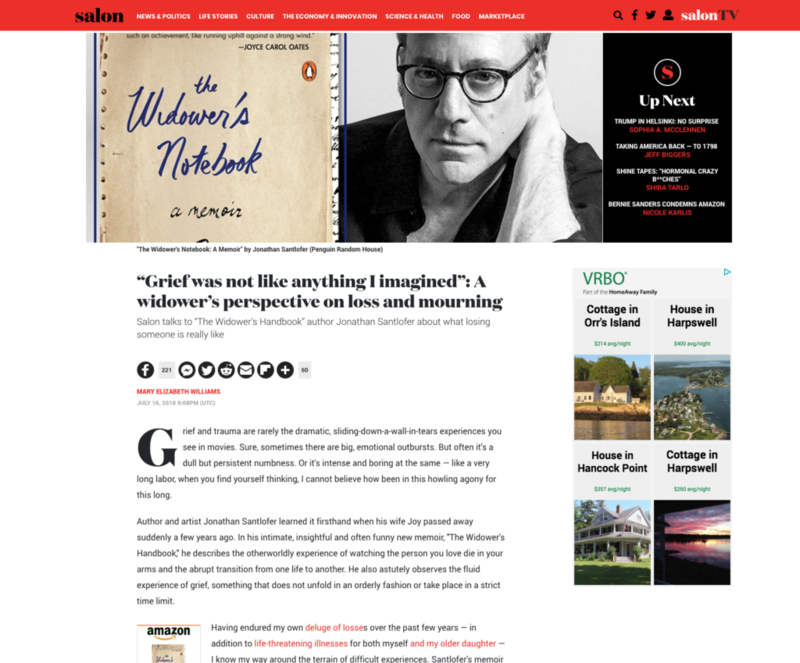 This entry was posted in Interviews and tagged Joy Santlofer, Salon, The Widower's Notebook. Bookmark the permalink.